NASHVILLE, Tenn.–Most cattle farmers would be elated to see their cows give birth to large, hefty calves. However, Emily Hayes rejoices over the smaller ones. 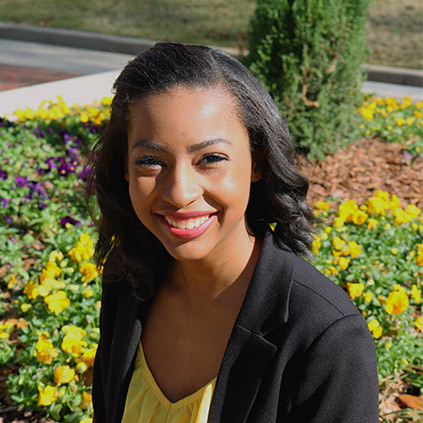 Hayes, 27, a graduate research assistant at the animal physiology laboratory at Tennessee State University’s Institute of Food, Agricultural and Environmental Research, is part of a TSU team studying cattle production and the breeding of Dexter cattle. An Irish breed, Dexter cattle are used for both milk and meat. They are small, about two-thirds the size of Angus cattle. Their stature is due to a form of a genetic condition linked to dwarfism, called chondrodysplasia. The condition affects bone growth and results in animals with short legs and heavy bodies. 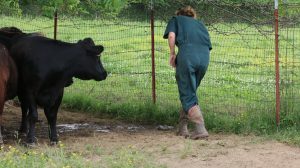 “Typically, Dexter males weigh about 1,200 to 1,500 pounds, whereas the average Angus bull can weigh a ton,” Hayes said. In height, Dexter cattle come up to the waist of an average-size, full-grown man. 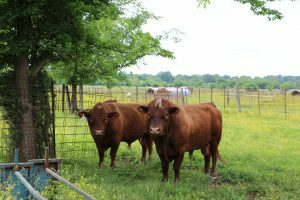 But these tiny cows can impact small-scale beef production in a big way because they require fewer resources – land, food and water – to meet their needs than larger breeds, Hayes said. Hayes noted that none of the TSU cattle has chondrodysplasia. Each animal was bred from one parent carrying only one copy of the recessive gene and one parent carrying no copies, resulting in calves that are small but healthy. Just how the gene impacting smallness is passed down in cattle is something Hayes and her team are studying. Most of the cows at the research farm were pregnant, and May was calving season. The newborns would likely weigh 35 pounds to 50 pounds, about the size of a full-grown female golden retriever, and give Hayes and her team a new herd of Dexter calves to measure, study and tend to.